Sri Lanka’s fabric industry is emerging from the closet and gearing up to make a strong country impact, with Textured Jersey leading the charge. One of Sri Lanka’s most sophisticated facilities for manufacturing knitted fabrics, Textured Jersey’s recent acquisitions of Quenby Lanka Prints Ltd. in June 2015 and Ocean India Ltd. in September 2015 as its subsidiaries have positioned it as the largest textile manufacturer in the region as it readies to make a regional – and global – impact. For Textured Jersey Managing Director/Chief Executive Officer Sriyan de Silva Wijeyeratne, these are exciting times indeed. “The fabric industry is emerging from the closet. For a Sri Lankan mill to reach this size and take the top slot is very interesting, especially given the competition from India. This is a big boost for Sri Lanka’s local footprint. It will also mean that policymakers and the Government will need to put as much attention into the fabric industry as it does for the apparel industry,” he asserted, in an interview with the Daily FT. Right now, TJL Group is the only one of its kind of this scale and sophistication in South Asia and the only multinational mill in Sri Lanka, a plum position that strengthens the Group as it steadily marches ahead – with its sights set on becoming a $ 300 million business by 2020. Its focus on innovation, execution excellence and on time delivery at the highest levels has certainly paid off, as evidenced by its Q3 results revealed on 2 February. Delivering its strongest-ever quarter, Textured Jersey recorded Q3 profits of Rs. 672 m, with strong 79% profit growth yoy, 48% revenue growth, and a 20% interim dividend growth. The Group’s consolidated revenue was Rs. 5.6 billion, 39% percent over the previous quarter, and 48% over last year. With a lot of apparel being produced in this part of the world, TJL always felt there was room to become a bigger player than what it was a couple of years ago, he revealed. With this plan to grow in mind, a few years ago a roadmap was drawn up on what it would take to become a different entity as opposed to being a factory alone. “Part of that journey was saying ‘let’s build this up into a strong corporate and establish a wide footprint and look beyond the traditional Sri Lankan boundaries and also look beyond TJ itself’. So stemming from that was the discussion around whether we grow organically or whether we acquire, which subsequently led to the ultimate acquisition and the partnership we have now with Quenby and Ocean India,” stated de Silva Wijeyeratne. TJL had entered into a management agreement with Ocean India several months earlier and was already contributing from knowledge and technical perspectives, which gave it a first-hand view so it could understand the company better. Quenby was one of its closest partners and was a top – and possibly the best – mill in the country in terms of supplier ratings, with very high standards. TJL felt these companies and their standing complemented its roadmap and as a result was very comfortable getting off to a faster start through acquisition. Outlining Quenby’s operations, Textured Jersey Chief Operating Officer – Engineering, Planning and Special Projects Janaka Gamage, who was formerly part of Quenby, said that the company specialised in printing of the fabric and was one of the first in the country to be established as a printing plant. “We used to print fabric from any mill that came to us and subsequently others mills started their own printing so we specialised in the high end of the print, like Victoria’s Secret. We were the first Grade 3 printer for Victoria’s Secret in Sri Lanka, which is a high classification to get to in the printing world. We were highly specialised in the Victoria’s Secret development cycle as well and we attracted the highest number of developments in the region. “That was the start for being one of the first class printers in Sri Lanka and we kept on that path, while also doing printing for Intimissimi and Marks & Spencer – all the best brands in the world. That is the expertise which we brought into TJ, which it didn’t have at the time. We decided to tie up because were looking for a firm raw material base and even before the tie-up, 60-70% of our raw material came from TJL,” he noted. Ocean India was a well set up factory with good machinery and most importantly a team with good potential, revealed Textured Jersey DGM – Operations Upul Mallaperuma. “In the last two years, we refined the process and provided technical support, after which the acquisition happened. It was a win-win relationship. Ocean India needed technical support and backup; similarly, TJ wanted to expand. Both these requirements were met with the acquisition,” he added. This is an exciting time for the industry, asserts de Silva Wijeyeratne. From a customer perspective, it’s a convenient one-stop-shop solution that cuts down on time and trouble, offering a huge reduction in terms of complexity and daily interactions. “If we start with the customer side, customers have long been wanting different parts of this synergy. Sometimes we have the same customer talking to Quenby for part of the solution, talking to us for something else and sometimes they might even want some part of the solution from India, but you have to speak to three technical teams and go through three submission processes. Innovation is key in staying ahead of the competition and Textured Jersey is leading the charge in this regard, asserts Gamage. “We are definitely ahead of the competition in terms of innovation and we also offer speed. Most of the customers opt for speed chase orders today and we are the ones who can offer a real solution. If you take the printing world, we are the fastest to print and deliver. In the fabric world, we give the best solution in terms of innovation and speed. Most of the brands are looking for speed solutions and our customers – the manufacturers – are also looking for speed solutions. Towards that end, we are the best in the country today. We are the backbone of any garment manufacturer’s speed solution,” he stated. It’s also interesting in terms of evolution of the fabric industry. “Today the fabric industry in this country is bigger than some of the historical big local industries and we are ahead of all the big names we have grown up with thinking ‘this is a big industry for Sri Lanka,’” he said. However, it has been somewhat overshadowed by the garment industry and the Textured Jersey MD/CEO believes it’s time to bring it out and start establishing the strength of the fabric industry on its own merits. Textured Jersey plans to expand Indian capacity at the right time and is also looking at getting into more sophisticated forms of printing, which will bring in added dimensions as the company grows. It has already set its sights on synthetic fabrics and has made some big investments in synthetic machinery, which will be operational in a couple of months. This brings a new dimension in the country which was not one of Sri Lanka’s strengths and the dimensions of the country’s fabric industry will change, stated de Silva Wijeyeratne. When the quota system was there, Sri Lankan apparel got in purely on quota and produced whatever was available, but towards the era when the quota system was moving out, they had to move up the value chain and started innovating a lot more and getting more sophisticated, he said, noting that the industry survived because it moved up the value chain. Revealing that at present around 90-95% of the synthetic fabric is imported for garment manufacturers, Gamage expressed optimism that the industry would be able to retain that aspect in the country as well. 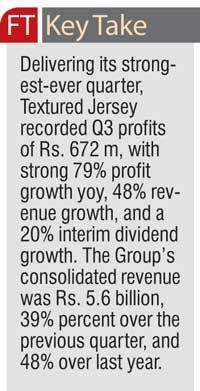 From a performance perspective, Textured Jersey has just finished its quarterly review and has recorded an all-time high of business performance, which was primarily driven by the massive turnaround it has been able to generate in both its subsidiaries. “Looking at the state at which we were, what the different teams coming together has brought to the table has created a huge synergy,” he affirmed. From a people perspective, it has become very exciting for the team as well, with careers suddenly opening up along with international exposure. “We will start building a more multicultural and multinational work ethic and environment. We don’t think of it as an India/Sri Lanka workforce. We will look at where the right skills are available and bring those talents into Sri Lanka. There will be knowledge transfer happening as well. There will be career growth,” revealed de Silva Wijeyeratne. From an employment perspective, the company has several expansion phases and plans to back them in place. Staff strength is at around 2,500 at present and Textured Jersey is operating on a fairly aggressive growth plan, with very ambitious investment plans for every year. “What that means is that we now need to bring in smart young talent. We are going to have almost a doubling of our workforce because of the capacity enhancement we will need, particularly in India. At the higher levels we will need a number of specialists in terms of project management, capacity expansion, safety, front-end merchandising teams, analysts, planners, etc., and we will expand our sales footprint and team. There is going to be significant job creation as part of this momentum,” said de Silva Wijeyeratne. Textured Jersey’s philosophy is horizontal expansion, not vertical. “We won’t backward or forward integrate to become a garment manufacturer, for example. People come to TJ for value added fabrics. Our average selling prices and sophistication are much higher. “If you look at India, it does a phenomenal job in producing selected fabrics in decent runs at very high quality. At Ocean India, for eight months in a row, 98% of orders were delivered on time. That is exceptionally difficult. Today we are benchmarking them, to see how, while we innovate, we could get to that level. We are in the high 90s but not as high as Ocean India, which has mastered some areas of fabric production,” he added. 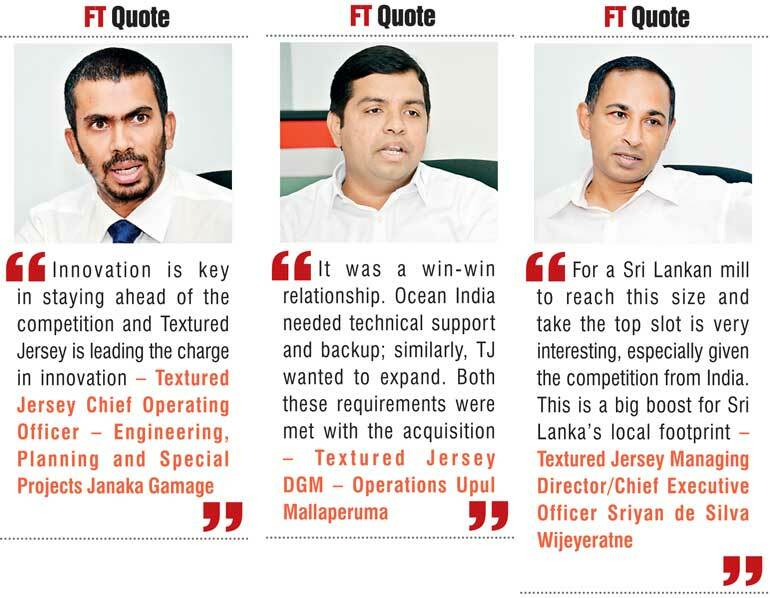 As it expands its boundaries and gears for growth, Textured Jersey is positioning itself to become a key player in changing the perception of Sri Lanka in terms of the industry. “We are certainly starting to think along those lines. If we can give to the textile industry what MAS and Brandix gave to the apparel industry, we think the apparel industry’s $ 5-10 billion journey will be mirrored by a massive growth in this industry,” asserted de Silva Wijeyeratne. “What are we trying to capture? The apparel industry is a global multibillion dollar industry and Sri Lanka is still trying to capture a small piece of the pie. The challenge is skills. That is the key. We are investing a lot in our training and development and cross-industry plus cross-company fertilisation. We are looking at different skills coming in and changing and evolving. Commitment to excellence comes naturally to Textured Jersey, which has won many awards in its pursuit of perfection, giving truth to its tagline ‘Textures of Perfection’. TJL was crowned world’s best when it won the prestigious ‘Firm of the Year’ title at the World Textile Awards, bringing glory to the Sri Lankan apparel industry, and also won Gold at the Social Dialogue Excellence Awards 2015, clinched first under Manufacturing Sector – Large Scale Category. In June 2015, TJL was selected as the ‘National Winner’ in the Manufacturing Textiles, Apparel and Leather Products category and as ‘National Runners-up’ for Excellence in Environmental Sustainability at the National Business Excellence Awards – 2015. It was also the world’s first mill to win the ‘Green Era Award for Sustainable Practices’ awarded by Association Otherways Management and Consulting – France, at the Platinum Technology Award Ceremony – July 2015. Textured Jersey also won five top awards at the National Business Excellence Awards awarded by the National Chamber of Commerce in November 2015. These 2015 awards are in addition to a host of awards it has won over the years since its inception in 2000.